The firm now has over 2,000 takeaways in Ireland on its service. PROFITS AT THE Irish division of online takeaway ordering service Just Eat more than doubled last year. Just Eat Ireland Limited, a subsidiary of the UK-based firm, was launched in 2008 and now has over 2,000 Irish takeaway restaurants available on its platform. New accounts filed with the Companies Registration Office showed that the Irish firm made a profit of more than €4 million last year, double the figure for 2015. The significant increase in profit came during the same year the firm hiked the commission fee it takes from each transaction by one percentage point to 13%. The fee has been steadily increased since 2008, when it stood at 8% for every order it processed. The Irish company also paid a near-€4 million dividend out to its UK parent last year, while the number of staff on its books increased marginally to an average of 38 people in 2016. The majority of those work in the customer support unit of Just Eat Ireland, while around one-third work in sales and marketing. In the directors’ report, the company highlighted the ”low barriers of entry” to the food delivery business as one of its key risks as this rendered it vulnerable to competition. 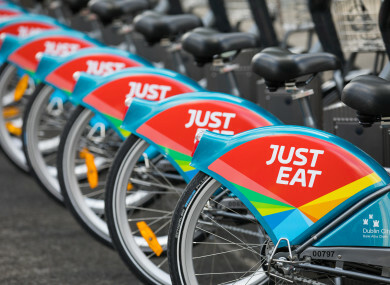 Since Just Eat launched its service in Ireland, a number of rivals have rolled out similar products. Its major competitor, Deliveroo, recorded a loss of €2 million in Ireland last year despite a significant spike in the firm’s revenue. The UK company, which has raised $860 million from investors, specialises in providing deliver services to restaurants without in-house drivers, whereas Just Eat acts as an intermediary for outlets and doesn’t provide its own drivers. A number of Irish-founded startups are also trying to take a slice of the online food delivery market here. Dublin-based Flipdish raised €500,000 in funding earlier this year and has plans to poach restaurants from services like Just Eat and Deliveroo by offering lower commission fees. Another food service in the same space as Just Eat is Bamboo, which has bagged €400,000 in funding from private investors. The early-stage Dublin firm doesn’t offer a food delivery service, instead it allows customers to pre-book their food order for collection. Email “Profits have doubled at Just Eat's Irish operation as its commission fees climb”. Feedback on “Profits have doubled at Just Eat's Irish operation as its commission fees climb”.